Six finals took place tonight determining Canada’s first National Olympic Team designates. Bout wins were clear cut and solidified by Mandy Bujold‘s business as usual approach, Kenny Lally’s consistent control and Clovis Drolet’s power to spare. The evening’s initial bout confirmed light fly-weight Todd Napper as advancing in the Olympic process in a unanimous decision against Quebec’s Renaud Young. Second up was Mandy Bujold’s start to finish lead using her expected precision and shifting speed. Appreciative of her unanimous decision, she added “Kim Klavel is a strong opponent and her coach knows me well. I certainly didn’t underestimate her but I’m focused on my ultimate goal”. Lally enjoyed his 7th national title and 121th career bout. “My opponent was young and talented and will certainly excel in the near future. I fell short of qualifying for the Olympics in 2012 but I now realize what it takes to fulfill my goals.” It fact, it was his experience and left hook that dictated the bout over Giovan Mathieu-Major from Quebec. Drolet was spectacular in his 3-0 win facing Kingsley Alexander. 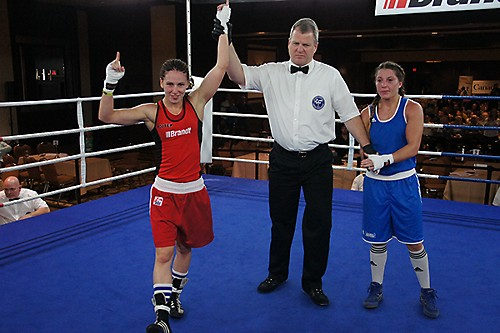 The bout was close but the Montrealer’s strength and aggressiveness led to victory. “ He has greatly improved displayed by wins over Blair and Arifi but my decision was very satisfying. I am continuing to improve and am proud of my confirming a third year on the National Team.” stated Drolet. Also added to the team are Alberta’s 81kg Petru Bulun and Ontario’s 91+kg Aaron Huggins with victories over Darren Gonzalez and Christophe Bernier respectively. Tomorrow’s last day of the qualifier will be well served with rising star Thomas Blumenfeld, Pan Am gold medalists Caroline Veyre and Arthur Biyarslanov, Quebec’s David Gauthier, two-time world champion Ariane Fortin and Commonwealth Games champion Samir El-Mais. Join the excitement! Tickets available at the Fairmont Queen Elizabeth Hotel venue.